Playmage Forum • View topic - Record breakers - We need your screen caps!!! Record breakers - We need your screen caps!!! 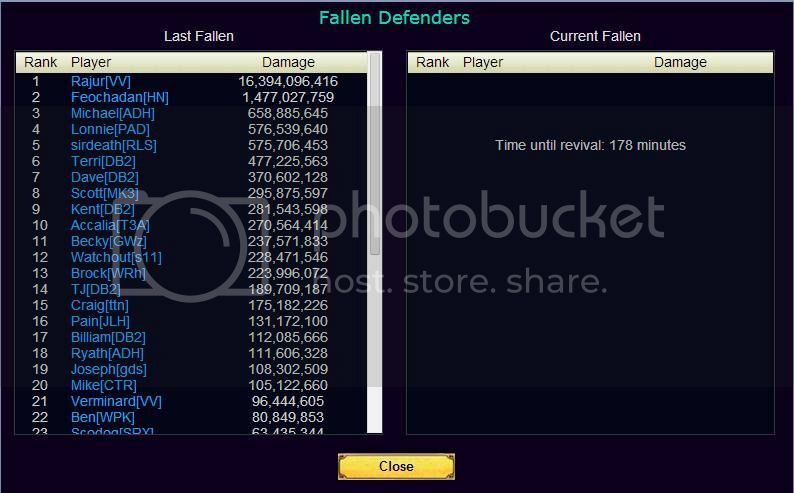 Due to Xandria's epic run on the current fallen, we were discussing who has the highest Fallen damage. What is the record? What other records are out there that people haven't seen, or have forgotten? So, we are thinking about adding a page to the http://dreamworldinfoshare.webs.com site honoring the record breakers of the game. We need screen caps for Atlantis, Fallen, Invasion (we already have the 1st Invasion screen cap), and other areas of the game. Please post your screen captures here. If you have a record breaker it will be added to the Hall of Records for all to see and try to beat. Re: Record breakers - We need your screen caps!!! Here's a new fallen record for you. It's already in the Hall of Records. Grats to Rajur for an impressive run on the Fallen.